A Journey to Bach - A Journey With Bach. 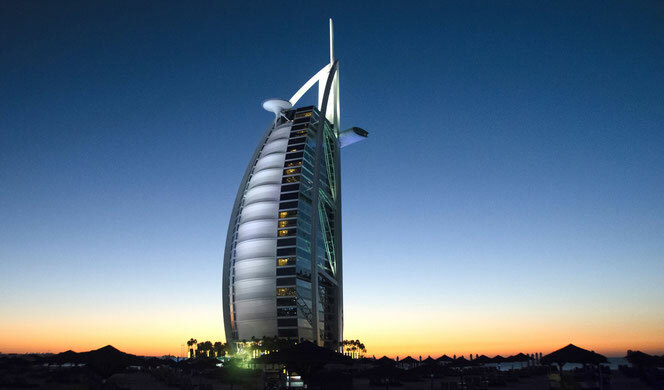 The Most Exclusive, Most Expensive, "Most Bach Experience"
Really the most expensive and the most exclusive Bach Travel offer "in the world". Why is that so? Actually, you must read the extended information to get the sense behind the whole offer. In particular, if you think the price tag is exorbitant. Just for those, who want to get a first impression ... fast ... you get two quick examples here. 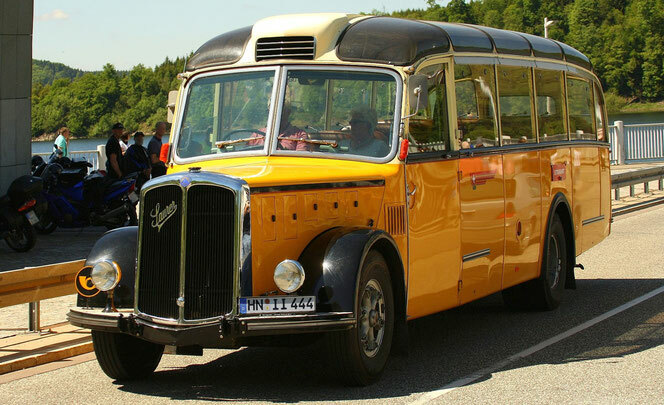 Your journey in Bach Country: You decide about the quality of the limo or bus we hire. Of course the bus above is a legend. However, we wouldn't accept your desire for that standard. 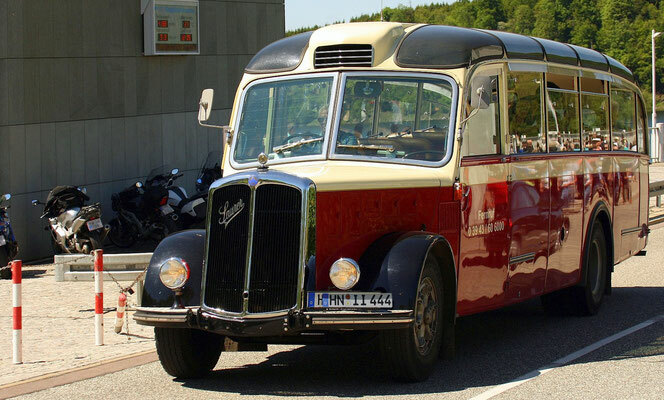 No kidding: There is a difference between hiring a stretched limo for 6 people of a new A/C equipped, modern small bus. We changed the license plate for data protection reasons, the one above is the one of my personal car and I have no problems with that. Your journey to Bach. 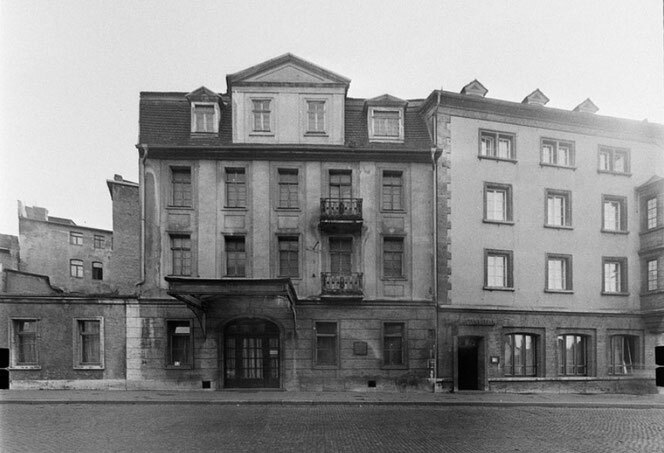 Explore, what's not there anymore: the Bachhaus, which is the Bach House, in Weimar. Read more about that terrible situation around the Bachhaus today. Just let's assume, you are a party of 6, you want to experience "Bach Country" in 6 days and you just have the money to "buy" the company of the speaker of the Bach family of musicians and his wife. You are aware, that this vacation will remain a lifetime highlight and you are willing to support the Johann Sebastian Bach Mission of both Bachs from Flein in Germany. You are right ... That - again - is no option to experience Bach Country with the 2 of us. But we found that vehicle so great, that we just couldn't hide it in the picture archive. *... You might buy it for € 700. ***... Such an event is - for instance - if we hire a musician to play on the organ in the Bach church in Arnstadt for your company. You can skip these highlights of course. 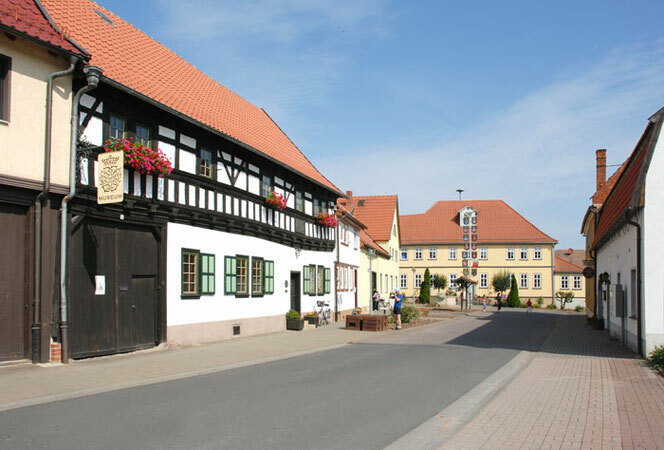 Of course a night in a hotel like the one above is way more expensive than in an inn next to the Bachhaus and the Veit Bach Mill in Wechmar (... picture below). It's your decision, what we suggest for your trip. You may spend the night either high end class or right in the middle and very authentic. The "Goldener Löwe", which is the "Golden Lion" (... the yellow building in the background). Of course, it's economy lodging and you must prefer the originalness to spend your nights where once a Bach was living. In most cases you can not have both. 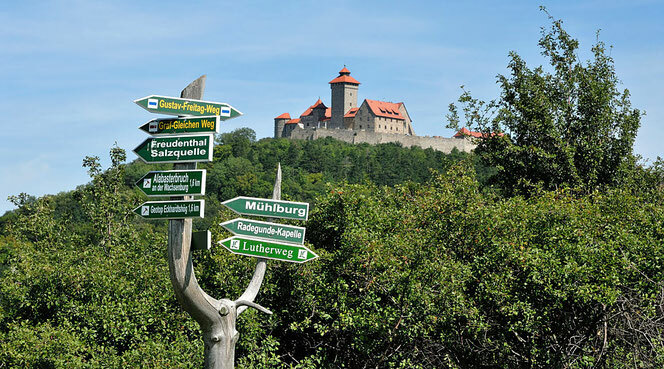 The Wachsenburg, which is Wachsenburg Castle. Making the night an even more exciting adventure is - of course - linked to a higher lodging price tag. 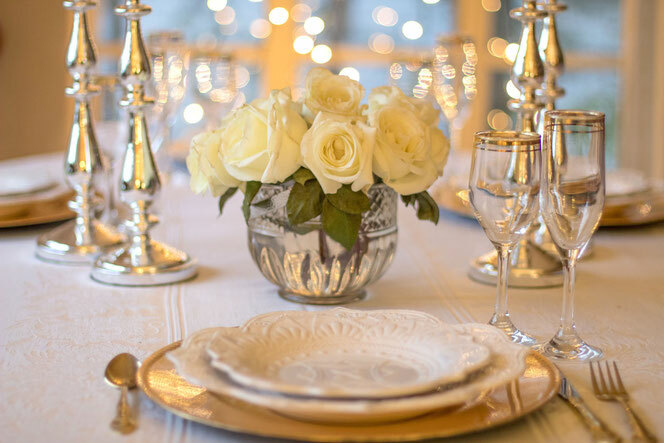 You tell us your expectations, we research for you and suggest a location. 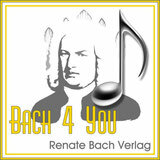 Just let's assume, you are a bunch of Bach enthusiast, maybe all members in the same Bach society, Bach choir or Bach orchestra and you are well aware, that having the cultural adventure of your life together with a real Bach family member is a luxury, which you want to afford one time only. However, you just want it. For you - as such a bunch - this price model is perfect, as it allows to book two different hotel room categories, even two different hotels. *... It could cost you more, it depends on your ability to shop flight tickets. **... We believe, a bus would do, but you could upgrade just for fun. 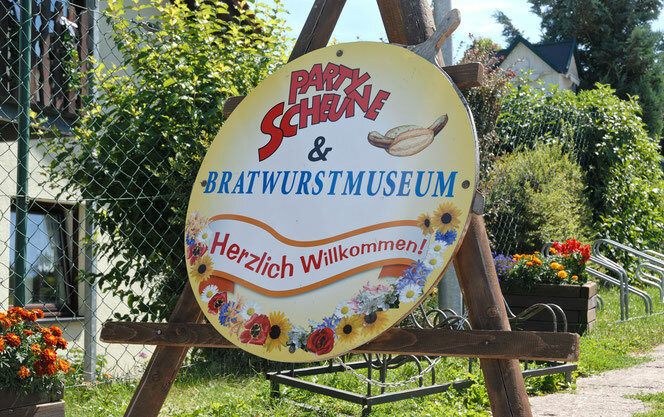 Sure, if you want to make each dinner on your Bach trip an additional event, maybe even at a 1 star or two star chef location, the price tag will be closer to 100 € per Person, compared to your preference to visit the "Bratwurst Museum" as an additional "non Bach event". It's all up to you. It's quiet an experience. 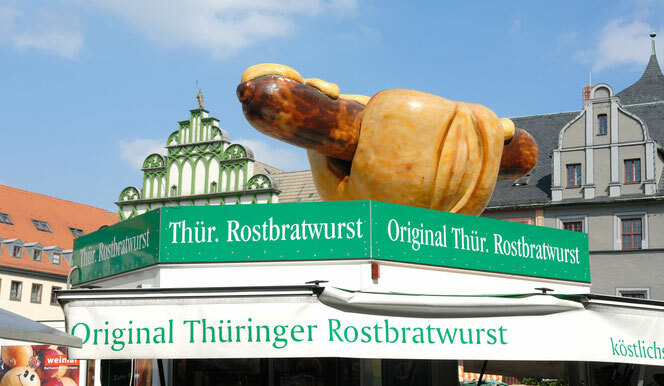 Let's have a Thuringian Bratwurst in Weimar. So, it's no risk. We buy one, cut it, everybody has a sample and orders after that. One and you are happy at lunch time, two and you are full. It's 2 bucks and you spend the saved money in a castle for dinner. For those who don't like it, there is a butcher next door. And a bakery. Of course, we do know special places to have dinner. With us dinner is no surprise in quality. So let's mix cool places like the Bratwurst Museum and a high end dinner at a noble place. 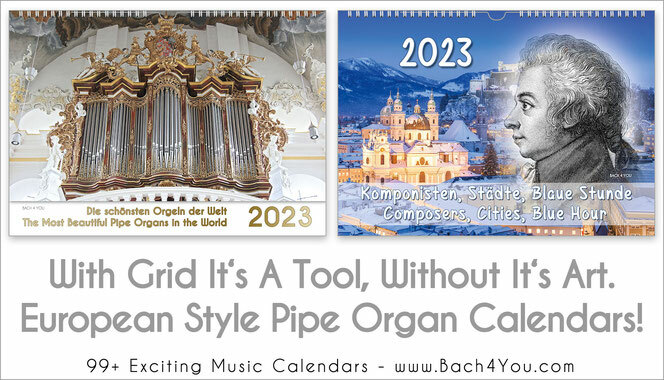 Pipe Organ Wall Calendars ... "Bach 4 You" offers 4 such calendars in European Style in its shop, 10 via its shop on Zazzle in a version with grid, so you can put in notes.